Final numbers show 6,683 runners for the 2014 ME. Ivey rolls the dice, ends up with a lot of chips. He’s still got it. And why wouldn’t he? 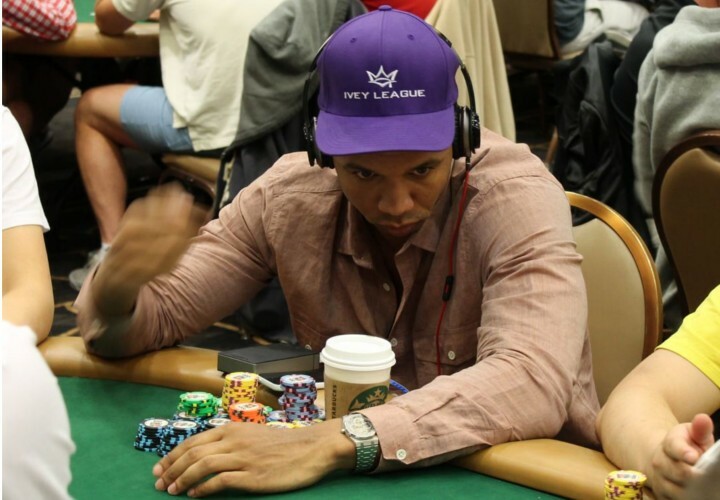 It was just a little over a week ago that the best poker player on the planet, Phil Ivey, won bracelet number 10 so it’s no surprise that Ivey’s feeling good headed into his run at the Main Event. But to finish 2nd in chips in the massive field that was Day 1C of the 2014 World Series of Poker Main Event – that’s, once again, impressive. Of the 3,768 runners who took their seats on Monday, all hoping to being their quest for $10M, Phil Ivey finished with the 2nd most in chips, right behind New Jersey player Eric Tracy. Ivey’s not the only big name to have raked a ton of pots as Jared Bleznick and Blair Hinkle both also finished with top 10 chipstacks. If that’s not exciting enough for you, Daniel Negreanu actually called his shot yesterday, declaring his intention to have over 100k at the end of the day and, well, he did. Kid Poker not only got to kick off the action by hopping on the mic and shouting “Shuffle Up and Deal!” yesterday, he also has a top 40 stack (129,250) to end the day with. If that doesn’t seem like a big deal to you that both Ivey and Negreanu are sitting pretty in this massive field, figure that 2571 people survived the day putting the bracelet bet partners both in the top 1% of participant. While there’s a very very long way to go, that’s a pretty good start. Other notables who piled more than t100k – Jake Cody, McLean Karr, Daniel Alaei, Jonathan Jaffe, Isaac Baron, James Obst, Brad Booth and Matt Matros. According to Andrew Feldman over at ESPN, there were a ton of former World Champs in the field as well. Carlos Mortensen, Jonathan Duhamel, Joe Cada, Joe Hachem and *Robert Varkonyi*s soared through to Day 2 while Jamie Gold, Jerry Yang and Greg “Fossilman” Raymer hit the rail. Phil Hellmuth made it through too and according to his own tweets, he’s putting a positive spin on his table demeanor this year. Of course, for some to succeed in poker, others must fail. Tom Dwan made an appearance, looking like he just flew in, and while he made it to the end of the day, he ended up going busto on the very last hand. Barry Greenstein fared a little better than Tom did, ending the day with just slightly above average chips. Other names that are on to the next one include Fabian Quoss, Shannon Shorr, Marc-Andre Ladouceur, John Racener, Jesse Sylvia, Jackie Glazier, James Woods, Dave “Devilfish” Ulliott, Kathy Liebert and Sam Trickett. With all the Day 1’s under wraps, the combined field of 1933 Day 1A & Day 1B survivors meet again today at 12pm PST to play another long 5 levels to see who chips up to return for Day 3 on Thursday.